In part one of this series we looked at how Google Slides could be used to create a video playlist and help develop student agency with your students. Part two investigated how we could make a listening slide for students to access independently in your reading programme. We all know the importance of providing differentiated activities within our classrooms and Google Slides is a great tool for providing these. Students can work at their own pace, they can collaborate and share their thinking with other students and they don’t feel pigeonholed as perhaps being in the ‘bottom group’. You can create differentiated slides in almost any curriculum area, but I used to use it the most within my maths programme. By using Google Slides all my students could access the learning intentions, success criteria, suggested goals, instructional material, practice activities and reflections. I could also provide links to the correct answers so students could check their work and not have to wait for the teacher to be free. Students could work independently or collaboratively, at their own pace, leaving me more opportunity to conduct purposeful workshops with individuals and small groups of students. 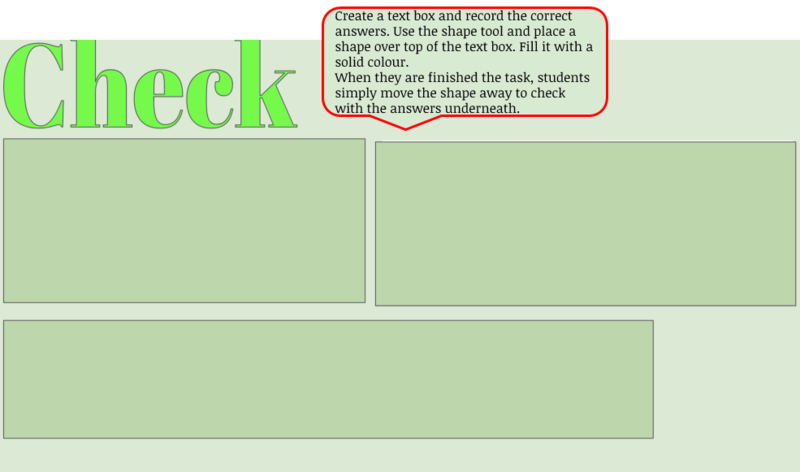 An example of a Google Slide centered around differentiated perimeter activities is here. The activities became more complex as they progressed and students were able to have more control of the choice of activities they completed. They didn’t have to start at the beginning and work through, they could complete what interested them once they had a working knowledge of what the perimeter is and how to calculate it. They knew about moving the shape away to reveal the correct answers when they were ready to check their answers. Interestingly some of my colleagues questioned me on this, suggesting they could simply view the answers before completing the task – but it’s no different to having the answers in the back of a book. Isn’t it a great time to talk about personal responsibility and integrity with your students if that starts to happen? I noticed a positive change in attitude with some of my more reluctant maths students when I started presenting maths tasks to them in this way. They felt more included in the maths programme and they began to feel that they could ’do’ maths after all. I think it was because they were finally included in maths discussions with everyone, they were hearing ideas and explanations from the more mathematically astute students and this helped them to understand things a little more clearly. How often have we heard that students learn best from each other! They didn’t complete as many activities as other students but they were ok with that. 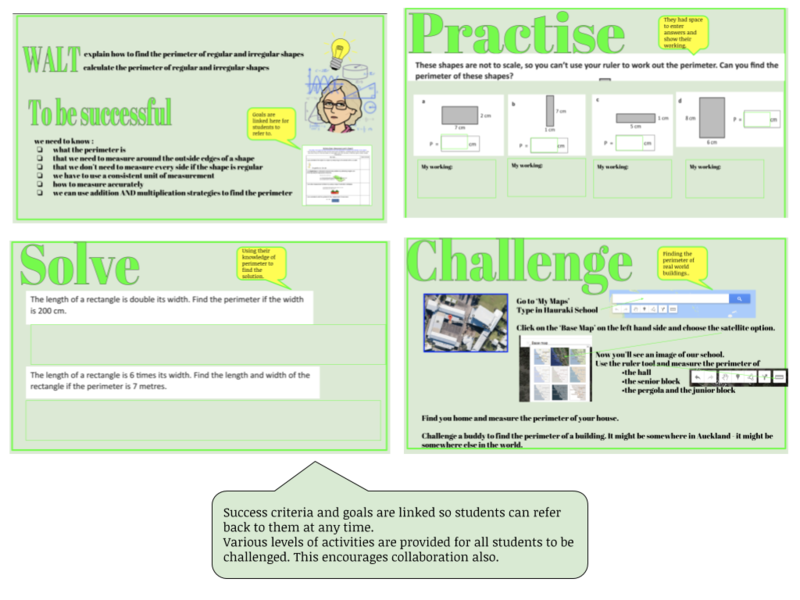 If you’re not already presenting differentiated tasks to your students in a similar manner I challenge you to give it a go. Google Slides is a great platform to begin with. I’m sure your students will thank you for it…. For more ideas on personalising learning with G Suite tools check out how to create hyperdocs to encourage independent learning or Sam’s post on using the Explore tool in Google Docs to build research skills with your students.